No one better personifies Iranian cinema today than Mohsen Makhmalbaf, a filmmaker whose life and career have been shaped—indeed defined—by the 1979 Islamic revolution and the complex forces surrounding it. Vividly and at times almost pitilessly, his films mirror Iranian culture in the years leading up to the revolution and following it. From the start, Makhmalbaf has explored the relationship between the individual and a larger social and political environment. As a result, his work serves as an extended commentary on the history of the Iranian state and its people. But if Makhmalbaf’s films are at times polemic, he nonetheless brings an artist’s sensibility to central issues of the human condition: God, love, regret, suffering, and injustice. In The Films of Makhmalbaf Eric Egan examines the close and volatile relationship between a highly popular art form and the politics of power in Iranian society. Through a critical analysis of Mohsen Makhmalbaf’s films, the book traces the development of Iran’s national cinema both before and under the Islamic Republic. An artist whose work is provocative and never far from controversy, Makhmalbaf’s films have always been reflexive meditations on the nature of cinema and art within a society. As Iranian society has changed so his films have progressed, from ardently advocating the declared ideals of the Islamic regime to criticizing the failures of the revolution and examining difficult topics, all the while elucidating the social and political role of art and the artist. The Films of Makhmalbaf is a vivid, informative, and valuable contribution to the unique world of this great filmmaker. 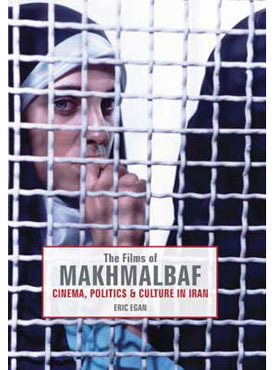 Eric Egan’s discussions are intelligent and reveal an exhaustive study of the haunted and haunting cinema of Mohsen Makhmalbaf; this book should be read by anyone seriously involved with Iranian cinema. – – Bahman Maghsoudlou, author of Iranian Cinema. – – – Jonathan Rosenbaum, author of Abbas Kiarostami and Movie Wars: How Hollywood & the Media Limit What Movies We Can See. A landmark study of a seminal Iranian filmmaker. Egan creates an exceedingly competent and illuminating narrative in which the birth and breeding of an Islamic Republic is brought to bear on the rise and celebration of an extraordinary force in world cinema. At once social history of contemporary Iran and critical commentary on one of its most significant filmmakers, The Films of Makhmalbaf will for a long time define the way social history of contemporary Iranian cinema ought to be written. – – Hamid Dabashi, author of Close Up: Iranian Cinema, Past, Present, & Future and Masters & Masterpieces of Iranian Cinema. – -Jamsheed Akrami, director of the films Friendly Persuasion: Iranian Cinema after the Revolution and A Walk with Kiarostami. Cinema as a mode of cultural expression acts as both a product and document of a society. As such it derives its immediate existence and relevance from a localized context of social institutions, events, upheavals and, most particularly, a culture that is reflected in the lives and aspirations of all people living within a society. Film situates itself within this cultural milieu as an art form that “reflects, directly or indirectly, both the components and the historical process of society.”1 The starting point for a critical engagement with cinema in Iran must begin with an interrogation of the processes involved in the formulation and use of cultural images as elements of differing ideological struggles. This book sets out to examine the development of cinema in Iran since the 1979 revolution as a reflection of the social, political and cultural development of the Islamic Republic, as illustrated through a critical case study of the films of Mohsen Makhmalbaf. To understand Iranian cinema is to understand the complex society from which it comes, the unique cultural elements from which it is derived and the particular ideological circumstances in which it operates. To understand the cinema of the most controversial film director to emerge under the Islamic regime is to stand in the eye of a storm in which these elements collide in a body of work that is provocative, committed and challenging, and that stands as a cultural document and testimony to one man’s attempt to make sense of his society, his art and himself. In attempting to document and critically evaluate the Islamic Republic of Iran and its cinema from the 1979 revolution to the present day, one figure stands out as a living embodiment of the social, cultural and political contradictions and upheavals that have taken place in the country over the past twenty-five years. Since his feature-film debut in 1982, Mohsen Makhmalbaf has continuously produced work that stirs controversy, provokes debate and is critically acclaimed both inside Iran and around the world. Makhmalbaf was born 28 May 1957 in Tehran. Makhmalbaf’s father, who already had another wife and two daughters, divorced Makhmalbaf’s mother after only six days of marriage—long enough to conceive Mohsen—and returned to his other family. Working to support her family, Makhmalbaf’s mother left her young son in the care of his grandmother, a devout woman, who raised him. Growing up in the politically charged atmosphere of the 1960s and 1970s, and under the influence of his stepfather, a lawyer, he became a supporter of the militant religious and political ideology of Ayatollah Khomeini, and began to agitate against the shah’s regime. * In 1972 he formed his own urban guerrilla group and was jailed two years later for attacking a policeman. He remained in jail until 1978 when he was released during the revolutionary fervor that toppled the shah. Following his release he began to turn his attention from armed action to cultural activities in support of the new Islamic regime, and he helped found the Center for the Propagation of Islamic Thought, a semi-governmental center that promoted artistic projects, and described as “an outfit of avowed militancy.”2 It was here that he began his cinematic career, directing his first film, a poorly made piece of Islamic propaganda entitled Tobeh Nasuh (Nasuh’s Repentance), in 1982. However, since this inauspicious beginning, his work has matured and taken on a chameleon-like quality in dealing with a host of complex and controversial themes—poverty, disillusionment with revolutionary ideals, forbidden love and the role of the artist in society. It is this desire to constantly stretch himself as an artist and to explore difficult and often highly contentious issues in his work that has made Makhmalbaf’s films exhilarating and incendiary. Indeed, it is the constant self-examination implicit in Makhmalbaf’s art that has helped it to evolve toward maturity through a series of different stages governed by similarities of theme, a preoccupation with certain issues and a particular aesthetic approach.† The first such phase may be referred to as the “Islamic” period, 1982–85, and covers his first four films. These were propagandist in nature, reflecting the idealism and faith in the Islamic utopia promised by the revolution and its leaders. The unifying theme is one of looking to God, a belief in the miraculous and the simplistic division of the world into good and evil. His second period forms a trilogy of films—Dastforush (The Peddler, 1987), Bicycleran (The Cyclist, 1989), and Arusi-ye Khuban (Marriage of the Blessed, 1989)—that were impassioned social and political commentaries. These works were concerned with documenting the state of the nation and the course and development of the revolution in its first decade. The subject matter is dark and religiously inflected, but God and religion are portrayed as more forgiving, understanding and less pedantic, yet still firmly located within the mores of Shia Islamic doctrine. In explaining The Peddler Makhmalbaf has said that the film intended to convey the message that God is the light and therefore the source of all life. Furthermore, death is seen as an eventual return to the light, with a person’s actions during the course of his life acting as the main factor in determining the quality of one’s life after death.3 In these films he is trying to distance himself from intolerance and focus instead on the human aspects of everyday life and humankind’s relationship with God. The media and, more particularly, cinema, have been the central cultural elements to have adopted a rebellious stance to the “objectively” created realities of nation and society that emerged after the 1979 revolution. In many respects (but not all, for example the theme of realism) cinema, like the country itself, returned to year zero, being remolded to fit and reflect the changed ideological requirements of the new regime and to serve the needs of a “hierocratic state.”* The cinema came to play a vital role, arising from what was essentially a media-influenced cultural revolution, in operating under a system of government in the Islamic Republic that has shown itself high on rhetoric and more interested in “changing cultural and educational institutions than in overthrowing the modes of production and distribution” that existed under the shah. In contrast, and as a type of reaction to this format, there has emerged a socially committed cinema comprised of “non-believing” directors who act as the “anxious eyes of the revolution,”* creating a cinema that politically and philosophically reflect the complexities of Iran and its society. In this regard it is inevitable that cinema has become a key element in highlighting and intervening in these problems that, as Makhmalbaf has noted, have “their roots in history and were of a cultural rather than a political nature.”10 Makhmalbaf, having been at one time a zealous supporter of the Islamic regime before becoming one of its most vocal criticsm, is perhaps unique in the sense that he has created examples of a revolutionary cinema both for and against the rhetoric of official ideology. This use of cinema in articulating contrasting ideological positions sees Iranian cinema in one sense being defined as a cinema of reaction. The Islamic Republic has reacted against the “prostitution cinema” of the shah’s era by redefining it for its own ends as an “Islamic cinema.” Likewise, the uneasy development toward a “quality cinema” (with the re-emergence of a number of pre-revolutionary and so-called non-believing directors) could be read as a reaction against the failure of a superficially Islamic cinema and an attempt by artists to regain and maintain control of the cultural landscape. Defining it as such allows for an explanation of the oft-cited simplicity of Iranian cinema as it has constantly had to remake itself to present a cultural form that, due to institutional pressures, has had to, in appearance at least, erase all forms of ambiguity. In the case of many Iranian directors this led to a superficially simple form and narrative style to which layers have been constantly added in order to achieve as much density as possible. This helps to explain the universal significance of a cinema located in and addressed to the local. The importance of the national is emphasized within Iranian cinema as it attempts to question the complex nature of Iran, its people and their problems, while simultaneously engaged in an exploration of the vicissitudes of the project of cinema itself. The 1979 revolution, the ensuing struggle for power in the country and the clerics’ subsequent attempts to Islamicize all aspects of life had a devastating effect on the film industry in Iran. Associated with the ills of the former regime and seen as a symbol of Western modernization cinema became a prime target of revolutionary zeal. Indeed, the spiritual leader of the revolution and Islamic state, Ayatollah Khomeini, decreed in a rather obscure statement that “We are not against cinema, we are against prostitution,”11 the interpretation of which Iran’s film industry has been trying to establish ever since.12 By the time the Islamic government was installed in power in the early 1980s, the industry was in ruins, production had become nonexistent, some 180 cinemas nationwide had been destroyed and an atmosphere of fear and uncertainty pervaded as to what was permissible in the changed ideological system. The situation was made even worse by the exile and departure of many of those who had worked in the industry during the time of the shah. It seemed at one point that the cinema would not be part of the cultural landscape of the new regime when the Ministry of Art announced the closure of all the country’s cinemas in 1980.13 However, once the clerics had gained power their task was to set about consolidating their position. Political consolidation meant cultural consolidation and as a result, the role of cinema changed. It soon became one of the most important elements in promoting the revolutionary Islamic ideology of the new regime. As a result, the medium was brought under the control of a central government and placed under a restrictive set of regulations designed to create a cinematic form in the service of Islam and the revolution. This situation has succeeded in creating a complex, fractious and uncertain relationship between the state and cinema. In the highly centralized and ideologically governed system of the Islamic Republic all institutions are designed to be at the service of consolidating and reproducing the clerical interpretation of Islamic ideology. Under such restrictive circumstances cultural norms are seen to have a greater and more direct influence on peoples’ daily lives and how they evaluate their social world. In this sense culture and political development have a large influence on one another and are sensitive to and defined by the changes that occur in both fields. The ideologues in the Islamic Republic have attempted to control all aspects of Iranian society in order to create a Shia-influenced political culture, infused with, when deemed necessary, elements of nationalism, revolutionary populism and concepts of social justice. As a key element in such an undertaking the cinema has served as both the legitimator of those in power as well as the voice of criticism in attempting to open a critical space whereby cinema can articulate the social realities of the country. Once the Islamic regime had succeeded in eliminating its enemies, silencing internal dissent and monopolizing the reigns of power, attention quickly turned to cultural matters. Buoyed up by the belief of the revolution as a unifying cause, the charisma and stature of Khomeini as a leader and the possibility of a utopian society, cinema began to emerge in its new Islamic format. The desire to construct a visual art form based on and in the service of Islamic revolutionary ideology led to the appearance of three new genres of mass cinema in Iran. These can be broadly summarized as the miraculous, which attempts, through depictions of piety and divine intervention, to justify an Islamic philosophical outlook on life; the “crime does not pay category”; and finally the war genre. Thematically, much of this work was enacted in the language and symbols of the Shia themes of sacrifice, dispossession and mourning, and portrayed—in the simplistic division between good and evil—the oppressed versus the oppressors. Mohsen Makhmalbaf, commenting on his own work during this period, stated that on reflection the Manichean division between good and evil was too simplistic and superficial, and that ideological positions are much too complex to defend in blind faith. However, it was not until the war had ended and the leader of the revolution, Ayatollah Khomeini, had died that filmmakers began to question and analyze the complexity of the conflict and the first decade of the revolution and its effects on the populace (although Makhmalbaf’s fiction of this time, while Khomeini was still alive, was highly critical of the Islamic Republic). In films like Makhmalbaf’s Marriage of the Blessed (1989) and Ebrahim Hatamikia’s From Karkheh to Rhine (1993), a more critical, personal and humanistic form of filmmaking began to emerge. It was this humanist message that was a key characteristic of much of the “new” Iranian cinema that appeared on the international stage after 1989. Indeed, the rise to world prominence of Iranian cinema has been quite remarkable and unprecedented. Its presence in international film festivals mushroomed from eighty-eight films in 1989 to 744 in 1995, with a concomitant rise in the number of awards won: eleven in 1989 to forty-one in 1995. However, these figures should not be considered in isolation, because they were the result of a number of different factors. Despite the lack of artistry in many of the films made during the first decade of Islamic rule this period did succeed in establishing an industrial and economic base capable of supporting and sustaining a production capacity that rose from seventeen features in 1981 to a high of sixty-six in 1992 and that currently averages around fifty productions per year. * Of equal importance was the emergence of an atmosphere of increased artistic freedom, which obtained as part of a larger drive to create a more liberal society following the war, allowing artists to explore a greater range of sensitive, controversial and hitherto taboo subjects. Furthermore, the regime, wishing to open up to the outside world and to present a more humane façade, saw the cinema, through the film festival and art cinema circuits of the West, as a means of counteracting negative stereotypical images of mad mullahs, terrorists and revolutionary zealots. However, given the multitude of meanings that a film generates and the friction that arises from a government intent on strictly controlling the medium—against the filmmakers’ desire to surmount these restrictions in an attempt to meaningfully engage with their art form—such developments only serve to highlight the fact that in Iran cinema is a cultural form at the vanguard of Iran’s unique social, political and cultural milieu. In this regard one of the main unifying themes of the films made in Iran since the revolution has been the restless journey of constant discovery, curiosity and search intimately connected to the immediate world. The Basis of a New Wave? This notion of search is a prevalent preoccupation of much of Iranian cinema, and it illustrates films’ ardent social engagement. The first decade under the new regime could be seen as a belief in and a search for the utopia promised by the revolution, followed in turn by disillusionment, a reappraisal of its broken promises and failures, and another search for a better social and economic life. This search continues following the post-1989 changes and is focused more on political issues—calls for a more liberal and tolerant society, a desire to open up to the outside world and an attempt to understand the role and position of the individual within a changing society. Following the election of President Khatami in 1997 a new phase began in which culture, cinema in particular, formed the main factor in the search for greater freedom, liberalism and the establishment of a civil society. The notion of search is a crucial aspect of Iranian cinema’s active intervention in social and cultural discussions for it allows the possibility of opening up a space of engaged debate that acts as a “guide to action rather than a specific or easily achieved solution.”18 Instructive in attempting to articulate such a space and standing as a manifestation, both personally and artistically, of the development of the Islamic state is Mohsen Makhmalbaf. He more than anyone has embraced this notion of search in attempting to find himself and Iran through cinema. This book devotes a chapter to each of the different stages of Makhmalbaf’s cinematic development. Each of these chapters begins with an examination of the social and political situation in Iran at that particular time, followed by its effect and influence on the cinema industry as a whole, before situating and analyzing a number of Makhmalbaf’s films within these developments. Chapters 1 and 2 establish a workable theoretical framework for critically analyzing, and understanding, the development of cinema in the Islamic Republic. The former seeks to understand it from within a reconstituted Third Cinema frame of reference as well as within the history of indigenous cinematic development. The latter examines the cultural and ideological foundations of the new Islamic state, showing that its founding principles comprised a number of competing intellectual traditions. Chapter 3 examines the claims for the establishment of a new form of cinema as the new regime sought to create an “Islamic cinema” that reflected the changed ideological circumstances. This new cultural form is evaluated by placing it within the historical development of Islamic art as a whole and the clergy’s attempts to instigate a form of cultural revolution by Islamicizing all aspects of society. This chapter will also assess the efficacy of this process and the claims of a new and unique cinematic form. Chapter 4 looks at the development—through a decade of war and revolution— of Iranian cinema, and also at culture as an official propagandist tool and the beginnings of more socially engaged cultural forms. Chapter 5 evaluates the development of a “quality” cinema in the era of reconstruction when Iranian films began to emerge in large numbers and gain recognition on the international stage. The final chapter looks at the current development of cinema in Iran as part of the power struggle that is attempting to introduce reforms and elements of civil society into the Islamic system. Throughout its twenty-five year history the Islamic Republic has constantly sought to create a society (based on the teachings of the Qur’an and the writings of its spiritual leader, Ayatollah Khomeini, as enshrined in its constitution) devoted to the service of Islam and the perpetuation of the revolution. Under such ideological conditions culture has become the main sphere of social transformation as the clerical rulers have sought to Islamicize all aspects of society. In such a context, culture, and in particular the media, have become the main method and means of disseminating the new regime’s message to the populace and instructing them of their expected role in the new society. Such an undertaking, which sees the Islamic state defined on the basis of a universal religious allegiance, has in effect abolished the mediation of culture. Under this highly centralized and repressive system culture and politics are intimately linked in a volatile and unstable relationship, holding a mirror up to official discourse. In this respect, the development of the Islamic state in Iran over the past two decades has been reflected in, documented by and developed in tandem with cultural modes of representation, which have, intentionally or not, functioned in the realm of the political. Because the new regime has sought to remove all traces of political opposition and abolish the notion of a civil society by enforcing its own all-pervasive notion of a religious society they have paradoxically succeeded in creating a situation where, having attempted to control or abolish all forms of oppositional discourses, have merely built a social environment in which every field of cultural production has become “a potential site for the expression of dissent.”19 Nowhere is this more relevant than in the cinema, given its popularity and universal appeal, and nowhere has its volatility and dissent been more evident than in the work of Mohsen Makhmalbaf. From ardently advocating the Islamic system to casting a critical eye on the shortcomings and failures of the revolution, from an exploration of controversial social issues to an examination of the cinematic medium itself, Makhmalbaf’s films are indicative of, and serve as commentaries on, the historical progression of the Iranian state and its people. Placed within the social and political developments of the past twenty-five years‚ Makhmalbaf’s films provide cultural documents with which to understand, evaluate and critically assess the development of the Islamic Republic and the significance of Iranian cinema. Eric Egan studied communications at Trinity College, Dublin, and earned an MA in Cinema Studies and a PhD in Iranian Cinema at Nottingham Trent University in England. He has published articles on the cinema of Iran, Pakistan, India, and Egypt, as well as on cultural policy and media in developing countries. He lives in Dublin, Ireland, where he teaches film studies at University College Dublin.